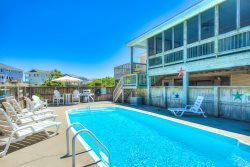 Summer Breeze is located on the sound side of Southern Shores, just minutes from the neighboring town of Duck. This home is easily accessible from the Wright Memorial Bridge, allowing you more beach time and less drive time. A short 3 minute drive to the beach with a large private parking area for direct beach access. Parking passes provided. The top floor of the house offers plenty of sunlight and features a reading nook area, open decks, and a screened porch where you can enjoy an outside dining experience. The spacious kitchen offers two seating areas, including a breakfast bar. A half bath is also accessible on the kitchen level. On the main level you will find four bedrooms, including a king master bedroom with deck access. one of the queen bedrooms has deck access and a flat screen TV. There is also another queen bedroom on this level, along with two full baths. The children in your family can enjoy a beautiful bedroom equipped with toys and a TV. On the ground level, you will find the hot tub and in close proximity you will find the fire pit and grill area. Summer Breeze is freshly renovated with new furniture/bathrooms and plenty of outdoor polywood furniture that is placed throughout the various decks. Summer Breeze is part of the Southern Shores Civic Association, which provides amenities that range from a community dock and gazebo to community tennis courts and ocean/sound access. The home is also minutes away from Sea Oats kids park, which features a play area and picnic spot. Top-Level: Living room/ Kitchen/ Dining area/ Screen Porch/ Nook Reading Area/ Half Bath/ with TV / Internet. Mid-Level: Four Bedrooms with Flat Screen TV's, and two Full baths, one is a master bedroom bath. We enjoyed the house with excellent interiors,and a brand new hot tub. The picnic area perfect for our s'mores time Our week has beautiful weather. We will definitely visit again. Thank you for great memories!